One of the hidden costs of production in the dairy industry is the cost of Green House Gas (GHG) externalities. 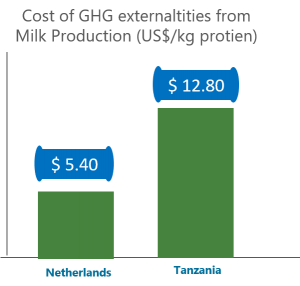 The cost of GHG externalities from milk production in the Netherlands is $5.40. In addition, this report compares this cost between the Netherlands and Tanzania as illustrated in the figure above. Description: The largest producer countries of animal protein such as the Netherlands and Brazil and countries with vulnerable and rich ecosystems such as Indonesia and Tanzania. A variety of production systems and products, from pastoralism to intensive agriculture and beef, poultry and milk products.